El dolor nos roba la paz interior…“El dolor que se calla es más doloroso”. Racine --- “El dolor, cuando no se convierte en verdugo, es un gran maestro.” Concepción Arenalero, ¿cómo hacerlo a diario? Si queremos crear un cambio significativo en el mundo, hay que empezar por mejorar nuestro proprio mundo interior. Si deseamos obtener un resultado diferente hay que cambiar algo para lograrlo. No podemos continuar hacer lo mismo y esperar que nuestra vida se mejore. Durante el taller "Paz Interior desactivando el dolor físico y emocional" exploraremos este tema empezando por mirar hacía el interior, tratar de ver lo que se esconde detrás de nuestras insatisfacciones y aprendiendo los aspectos que definen nuestra percepción y/o distorción de la misma. ¢20,000 si pagado ANTES del 10 Sept.
* No se aceptará inscripción el dia del evento ya que hay material y comida que preparar. Gracias por su comprensión. Una vez hecho el pago, favor mandar el comprobante con su nombre completo al correo siguiente. Un documento les estará mandado de vuelta para prepararse a la capacitación. a un estado de paz interior! how, in conjunction with the Costa Rican Government, it's developing and expanding; school selection and preparation for the program; student and teacher selection, and many more forays into this new educational adventure. Join Daniel, himself a graduate of the IB program, and Elena Austermühle, former IB teacher and subject developer, for an inside look at this new program that the Women's Club is supporting. • Get off at the FIRST Escazú exit (at WalMart) & immediately get in the right lane. 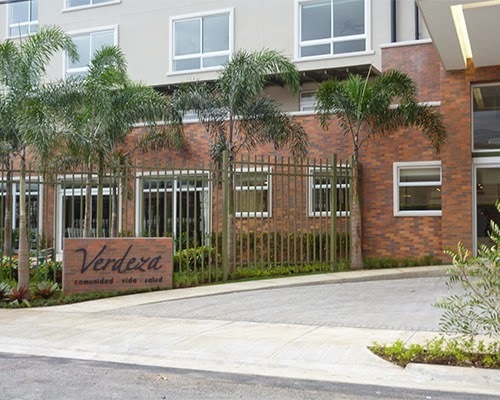 • Go down 800 meters•8 blocks•1km West of Walmart to Verdeza - which is on your RIGHT side (almost to the end of the street). There is plenty of parking on the street or in their garage. • At the end of that block turn RIGHT. Democrats Abroad Costa Rica•DACR - Monthly Meeting - AUGUST 30 - “Global Warming: Everything you didn’t want to know about Climate Change because you were afraid to ask"
There are MANY different Groups • Clubs • Associations • Classes happening around to Connect & bring together ExPats • people • newcomers from other countries that are living in Costa Rica! BOOKMARK it & keep checking back!! 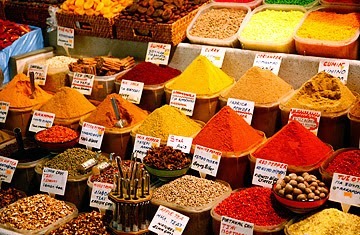 Amig@s: aqui esta la lista de productos actualizada de Restaurante Gokul y Namaste. Abrimos el Lunes!!!!!!!!!!! 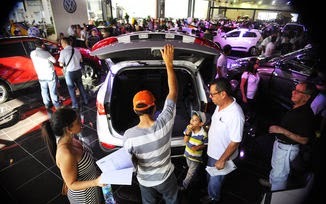 attendees will find cars from ¢4 million and up; of all brands and for all purpose. Banco Promérica and Financiera Desyfin. U.S. taxpayers who failed to file all those forms required by the U.S. Internal Revenue Service now have a second chance. The IRS has expanded its amnesty program for overseas taxpayers, according to Randall J. Lindner, an enrolled agent and principal of U.S. Tax International in Rohrmoser. Lindner said that the U.S. tax collector just changed the rules and those overseas who have failed to file such documents as reports of foreign bank accounts or even tax returns, can do so without penalty for an undetermined time. The IRS itself says that the so-called streamlined filing compliance procedures are available to taxpayers certifying that their failure to report foreign financial assets and pay all tax due in respect of those assets did not result from willful conduct on their part. true of many U.S. taxpayers here who have been confused by the various IRS demands. He called this a great opportunity for those who must comply with IRS rules to come clean. Many expats have fallen behind on their obligations to the Internal Revenue Service, and many have been fearful of being forced to pay large penalties. These include expats who might own a foreign corporation or a foreign bank account. The IRS has had other programs to encourage compliance, but participation usually generated stiff penalties. And in the past some avenues were only open to taxpayers who owed $1,500 or less. That limit has been waived. The new emphasis also applied to those who may have U.S. tax obligations but have lived much of their life overseas. Dealing with the IRS always is complicated, and Lindner has outlined the new opportunities in detail HERE! Many U.S. Citizens who move abroad remain ignorant of their U.S. tax obligations for many years after moving. For those unaware, U.S. citizens are taxed on their worldwide income, no matter where they live when they earn the income. While there are U.S. tax benefits to living abroad, such as the foreign earned income exclusion, there are also some additional filing obligations that may apply to U.S. citizens living abroad. If U.S. citizens have more than $10,000.00 in bank accounts located outside of the United States, they must report these accounts to the government. If U.S. citizens own more than 10 percent of an overseas corporation, they may have to report this to the U.S. Internal Revenue Service as well. U.S. citizens must also disclose certain trust activities, and their ownership in certain foreign financial assets. These disclosures apply to U.S. citizens no matter where they live, but are more common among Americans living abroad. The penalty for failing to file the bank account or corporate disclosures or for filing them late can become astronomical. In one case, a Floridian had $1.6 million in overseas accounts that he failed to disclose. The IRS penalized him for more than $2 million. This was a noteworthy case because the IRS doesn't usually come down quite this hard, but fines can still reach tens of thousands of dollars regularly. Referral to the Department of Justice for criminal prosecution is also a possibility. Many U.S. citizens residing abroad only realize they need to file these forms many years after the deadlines have passed. The IRS has had programs in place for the last few years to encourage taxpayers to file their disclosure forms, but these programs have often been restrictive and punitive. On July 1, 2014, the IRS updated its two main programs, offering a new way forward for taxpayers with delinquent forms. The Offshore Voluntary Disclosure Program and its sister program, Streamlined Filing Compliance were both updated. While there are many details to both programs, the main points are this. The Offshore Voluntary Disclosure Program (OVDP) is for individuals who believe they are at serious risk of criminal prosecution. A person entering the OVDP must pay all penalties, but in return receives amnesty from a potential criminal prosecution. Streamlined Filing Compliance is for the less serious cases. The person using the Streamlined procedures receives no guarantees but is not expected to pay any penalties. Until the new updates, the Streamlined Filing Compliance was much more restrictive. It only applied to Americans living abroad for several years, who owed less than $1,500 in tax, and who had not filed any tax returns for several years. The new updates lift these restrictions and open the program to anyone who fails to make disclosures due to "non-willful" conduct. What does non-willful mean? According to the IRS, non-willful is "conduct that is due to negligence, inadvertence, or mistake or conduct that is the result of a good faith misunderstanding of the requirements of the law." This describes many if not most overseas Americans who fail to make information disclosures. To take part in the Streamlined Filing Compliance program, the taxpayer is asked to file three years worth of tax returns and six years worth of bank account reports. The taxpayer is also asked to sign a certification that the failure to file was non-willful. The catch here is that if the IRS decides the conduct was, in fact, willful, then the IRS will not accept the submission through the streamlined procedures and may refer the case for penalties or prosecution. If the failure to disclose was in fact willful, the OVDP is a safer program. More information regarding these programs is available at the IRS website. As always, contact a professional if you need help with tax compliance. *Randall J. Lindner is a principal in U.S. Tax International. STRESS MANAGEMENT, BODY ALIGNMENT AND MINDFUL EATING ONLINE! If you are overcome by stress, overwhelmed by responsibilities and urgently need to make changes in your life but a personal visit is impractical, you should use my online service to make a private, interactive consultation, in a virtual meeting space. My proposal is based on the holistic assessment of your being by recognizing your body, mind and emotions. We start by reducing your anxiety levels with easy-to-follow stress management techniques, which will transform your life. Second we address postural habits which can be modified with simple body alignment tips, which will help not only by relieving back pain, but by also improving your general well-being. Third, you will learn how to eat mindfully which completely changes the old paradigm of dieting, reducing anxiety, providing more energy and vitality to you life. "Your nutrition is reflected in your state of mind; your state of mind is reflected in your thoughts; your thoughts are reflected on your attitude"
Si te sientes estresado, abrumado por las responsabilidades y urgentmente necesitas hacer cambios en tu vida pero no tienes tiempo para una visita personal, puedes usar mi servicio en línea para tener de forma privada e interactive tu seción en un espacio virtual. Mi propuesta se basa en la consideración holística del ser, reconociendo el cuerpo, la mente y las emociones. Iniciamos con técnicas sencillas para reducir los niveles de ansiedad, que van a transformar tu vida. Segundo, analizamos los hábitos posturales para sugerir simples modificaciones con las que no solo se van a aliviar los molestos dolores de espalda, sino que también mejorar la sensación de bienestar general. Tercero, aprenderás a comer concientemente, lo que cambia completamente el viejo paradigma de las dietas, reduciendo ansiedad y aportando energía y vitalidad a tu vida. This is 2-weeks of hands-on and feet-in learning, classroom theory and discussion, and slideshow presentations and evening topic discussions. 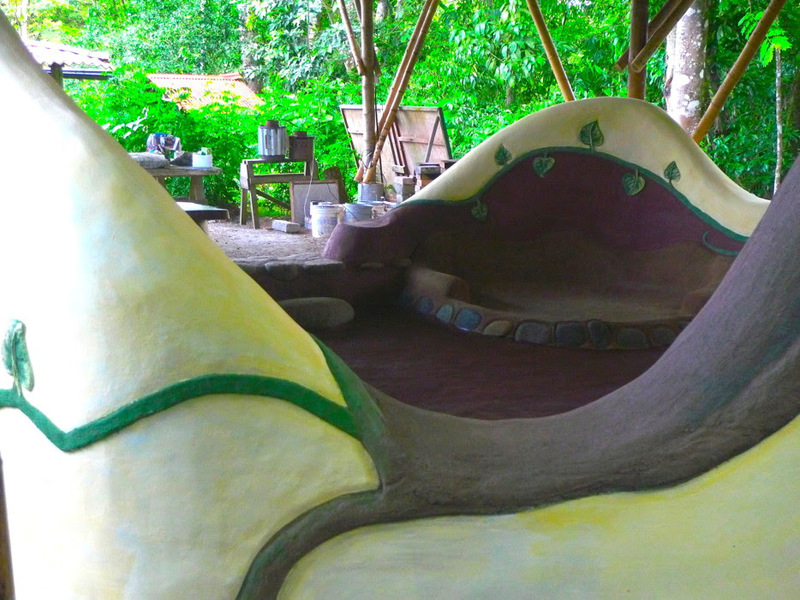 We will cover everything earth, lime, and clay from site selection, foundations and earthen wall systems, to the fine art of sculpting, Moroccan tadelakt, and finish plaster. 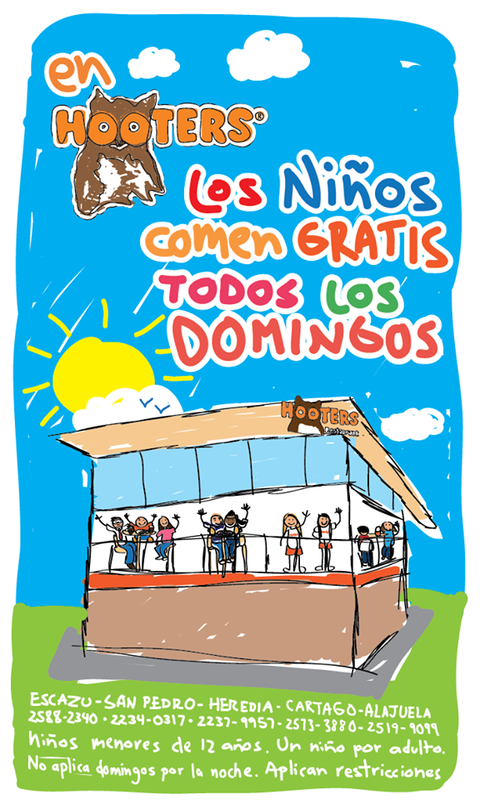 RESTAURANT SPECIALS - KIDS related - including KIDS EAT FREE around Costa Rica!!! Registrense ahora y si gustan armen su círculo de mujeres para recibirla , los hombres también son bienvenidos hay una meditación especial para ellos! La hora CR también aplica para nuestros paises hermanos de Centroamérica: Belize, El Salvador, Guatemala, Honduras y Nicaragua. Para Panamá sumar una hora más a la hora de CR. EL 8 de Octubre únete a nosotras para recibir la bella energía de la canalización de La Divinad Feminidad por Miranda Gray y las Moon Mothers, compartiendo con todas las mujeres del mundo. RECIBIR LA BENDICIÓN DEL ÚTERO TOMA COMO MEDIA HORA. No necesitas estar conectada online para participar, simplemente encuentra un lugar tranquilo y únete a la meditación. Puedes hacerlo sola o puedes participar compartiendo la invitación con tus amigas, o puedes participar en un grupo organizado de mujeres. Para el hemisfero sur: Aceptando nuestra sexualidad. ** En Costa Rica y países tropicales pueden elegir hacer cualquiera de las 2. Solo observen como cambia la naturaleza alrededor y elijan la que más resuene. 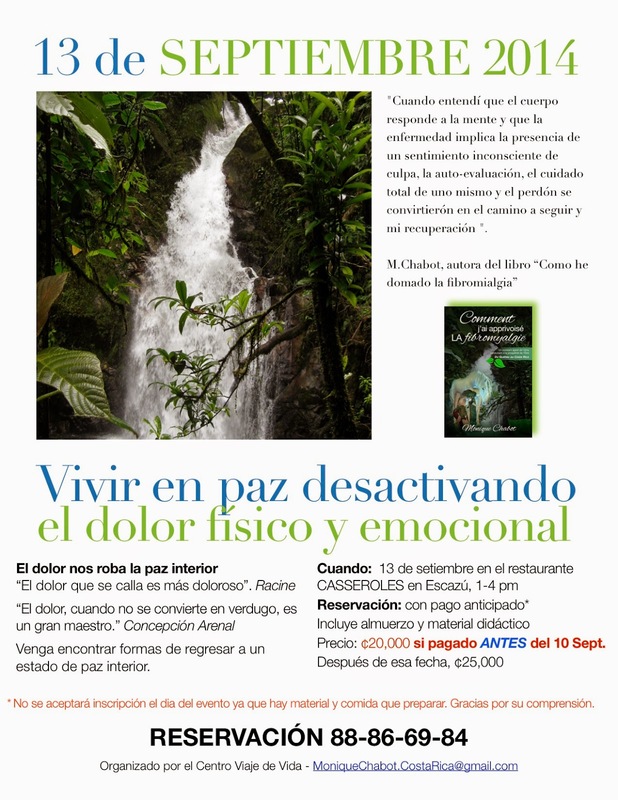 Las meditaciones adicionales están disponibles en el area de descarga de la Bendición de Útero. Recibirás el enlace a la pagina al registrarte. Somos ahora mas de 75.000 mujeres en la familia Worldwide Womb Blessing. Todas hemos respondido a un profundo deseo de conectar con cada una para celebrar nuestra Esencia Femenina. El despertar de la autentica feminidad que llevamos dentro, nos trae una nueva energía, haciendo mas fácil para nosotras tratar con la ocupada agenda de nuestras vidas en un mundo que es cada vez mas agitado y estresante. Esta energía nos permite oir mas a nuestro cuerpo y a nuestra naturaleza femenina y encontrar la dulzura y belleza dentro de nosotras.. La conexión con La Divina Feminidad que la Bendición brinda nos hace mas abiertas y seguras de nosotras mismas, mas libres para expresar nuestra personalidad. Nos sentimos amadas, sensuales, delicadas y bellas. Sign up now and if you like armen its circle of women to receive it, men also are welcome there is a special meditation! http://www.mirandagray.co.uk/register.html registration is free! Because it is an act of love for us and for all the women of the world the time CR also applies to our brothers in Central America countries: Belize, El Salvador, Guatemala, Honduras and Nicaragua. One hour at the time of CR added to Panama. 8 October join us to receive beautiful power of channeling the divinity femininity by Miranda Gray and the Moon Mothers, sharing with all the women of the world. RECEIVE THE BLESSING OF THE UTERUS TAKES LIKE HALF AN HOUR. You do not need to be connected online to participate, simply find a quiet place and join the meditation. 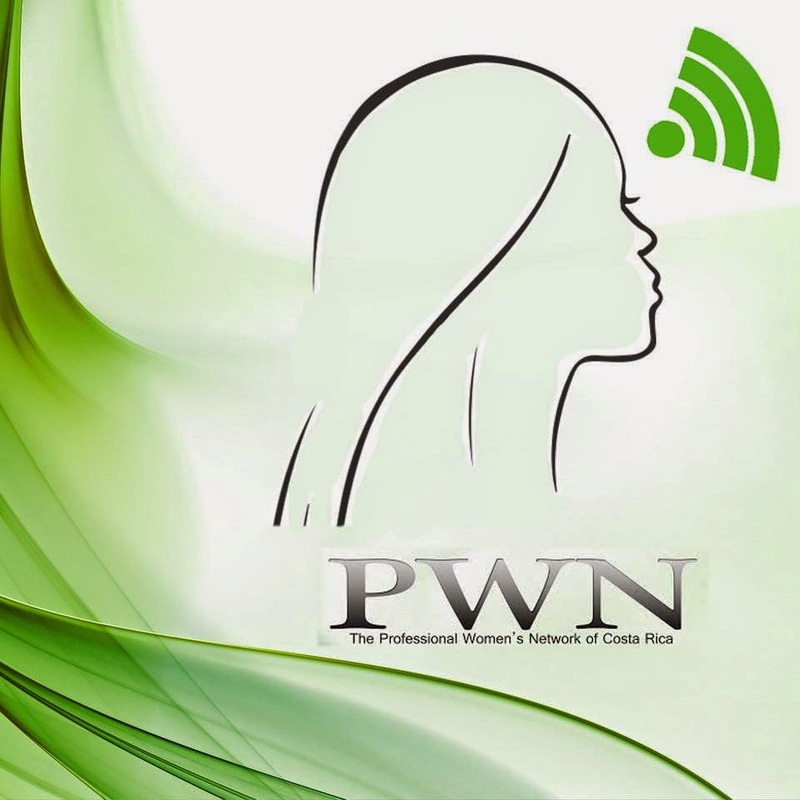 You can do it alone or you can participate by sharing the invitation with your friends, or you can participate in an organized group of women. 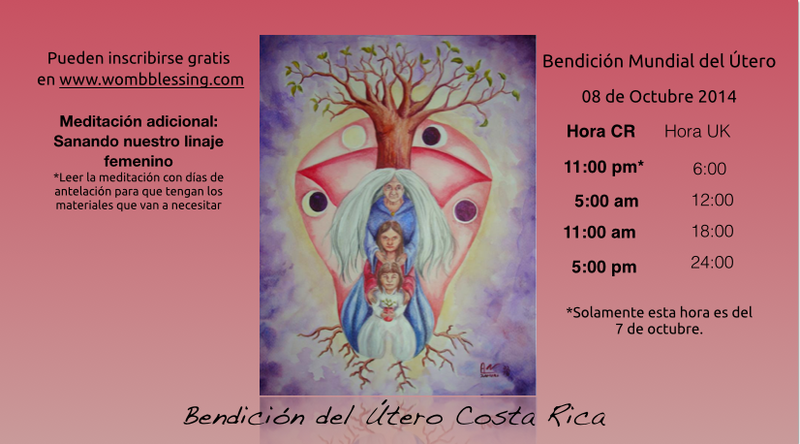 Blessing of the uterus: Costa Rica: Womb Blessing additional meditations for the blessing of uterus of October are: for the northern hemisphere: meditation of the female ancestral lineage (Costa Rica) for the southern hemisphere: accepting our sexuality. * In Costa Rica and tropical countries can choose to make any of the 2. Just look at how it changes nature around and choose which resonates more. 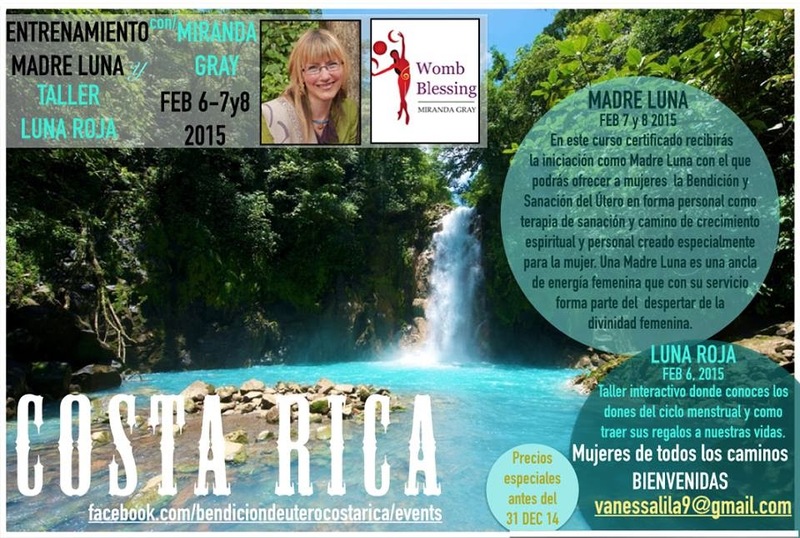 Additional meditations are available in the download area for the blessing of uterus. 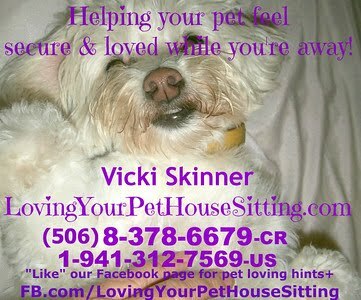 You will receive the link to the page to sign up. We are now more than 75,000 women Worldwide Womb Blessing family. All have responded to a deep desire to connect with each one to celebrate our feminine essence. The awakening of authentic femininity that we carry within us, bring us a new energy, making more easy for us to deal with the busy schedule of our lives in a world that is becoming more agitated and stressful. This energy allows us to hear more to our body and our female nature and find the sweetness and beauty within us... The connection with the divine femininity that blessing offers makes us more open and secure ourselves, freer to express our personality. We are beloved, sensual, delicate and beautiful. $100 Exit Fine directed at Nicaraguan Workers - NOT "Perpetual Tourists"
The fine went into force Aug. 1, so Sept. 1 is the first day the immigration officials will be collecting it at the border. In addition, those who have overstayed their permissions will have to remain outside the country for three times the period that they were here with expired paperwork, according to the Dirección General de Migración y Extranjería. 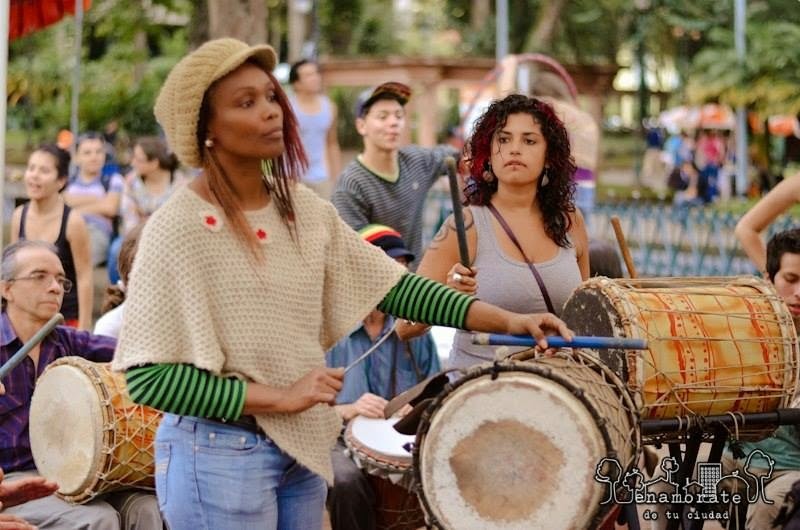 el círculo de tambores en el Parque - buena vibración...... !!! DRUM CIRCLE - 2 hours of good vibration! 2,000 colones por vehículo•vehicle, todo el día•all day. 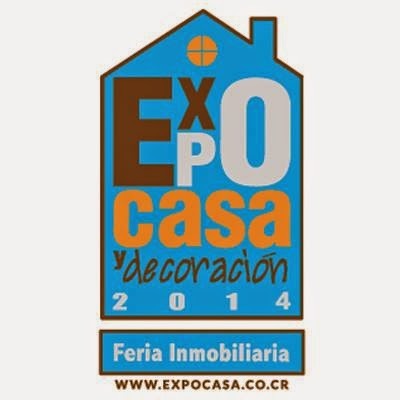 Aug 23rd and 24th 2014 at Feria International De Libro, being held at Antigua Aduana, San Jose. Rachel, Angela, and Maggie have not seen each other in over 2 decades. Inseparable friends until then, the course of their lives took them to different places. But at this stage of the game they have a common anxiety, approaching their “special years” alone and unfulfilled ... During a long night they try to find a solution to the loneliness and latent frustration. They come up with an unlikely one, and all they need is a little help!....and someone to provide it! 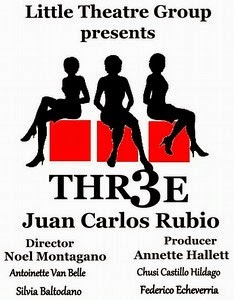 directed by LTG veteran Noel Montagano, and featuring four talented actors Antoinette Van Belle, Chusi Hildago Castillo, Silvia Baltodano, and Federico Echeverria, this play will make you chuckle but might also make you reconsider what is really the secret of happiness. 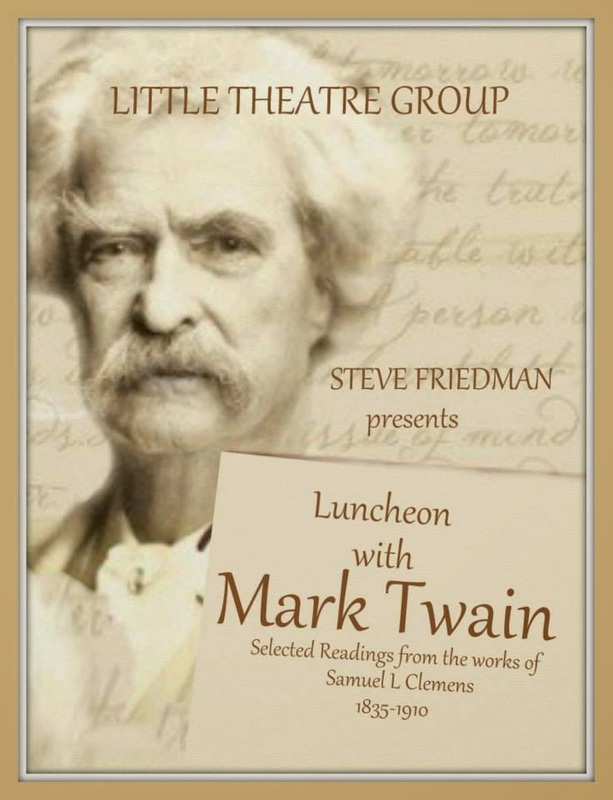 An adventurer and wily intellectual, Mark Twain, author of The Adventures of Tom Sawyer and Adventures of Huckleberry Finn had many different careers in his life and wrote about them in prose which captured the American vernacular and tickled its funny bone. His personal life was largely unsuccessful and unhappy and many of his business ventures were poorly chosen and bankrupted him.It was his charm and integrity that allowed him to pay back all his debts with the proceeds of his highly successful lecture tours. 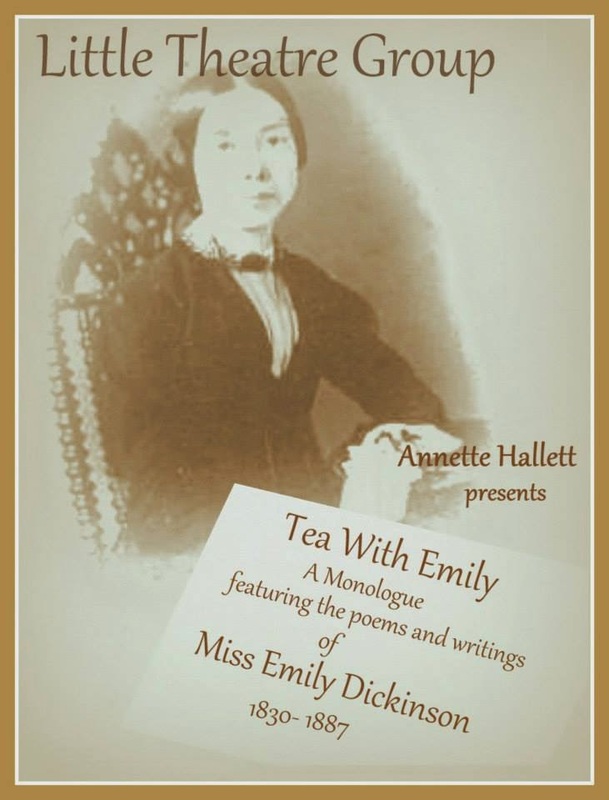 One of the most highly regarded American poets, Emily Dickinson, a famous recluse, dressed in white and secretly produced an enormous canon of poetry, which she hid from her family. Her works were only fully discovered and published some years after her death Her personal life and its mysteries have sometimes overshadowed her achievements in poetry and her extraordinary innovations in poetic form. Some consider that Walt Whitman is her only equal in legend, and in degree of influence.